In Northern California, the third Saturday of March is dedicated to a ritual more dependable than ground hog day. 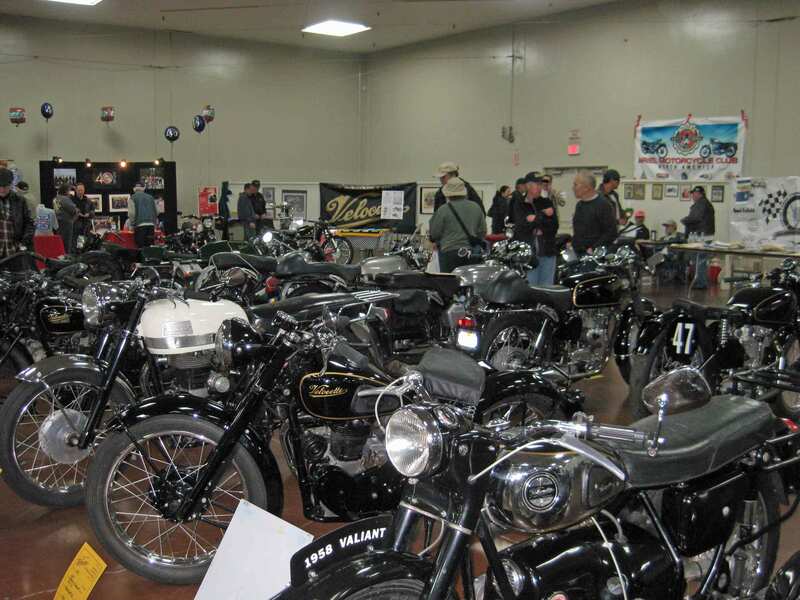 On this day, rain or shine, devotees of British motorcycles gather at the Santa Clara County Fairgrounds for the Clubman’s All-British Motorcycle Show and Swap Meet. The BSA Owners Club of Northern California sponsors the meet, but all enthusiasts are welcome. Some of these enthusiasts are smart enough to arrive the day before. This has never been my fortune. Instead I travel at 0-dark-thirty in the morning from the Bay Area. This year my party included microcosm of the types of people you find at such an event. I traveled with a Captain of Industry, a Working Class Hero, and the Rebel who calls himself a Patriot. In order to make sure we didn’t miss a moment of fun, we got started at the impossible hour of 4:30 a.m. This year the Captain of Industry supplied the truck we were to travel in. It came complete with a camper and a trailer large enough to haul the two bikes he wanted to put on display, plus three others that belonged to the Rebel and myself. 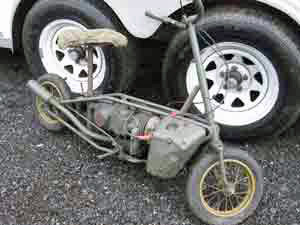 At the last minute the Working Class Hero offered to bring along his World War II folding motorbike. Fred, the Captain of Industry, oversees the loading of his trailer. Anyway the Rebel and I drove from Vallejo to Pinole and knocked on the Working Class Hero’s door. Still no one staggered to the door. How long should you wait for a Working Class Hero in the dark? We gave him nine minutes. Then we continued on to the Captain of Industry’s home in Martinez. Here we drank coffee, made pit stops and discussed omens. We were just walking out to our gravel-crushing chariot, when a squeaky Toyota bounced through the gates. The Working Class Hero had suffered the indignity of a sick cat, and after changing the sheets on his bed, had closed the bedroom door. This door kept not only the cat out, but also any sounds emanating from his phone or front porch. At least that was his excuse. Blame it on the cat. Relieved that everything was now in alignment, we got on the road. The drive, parking, set-up and all the other organizational details went smoothly. This was due mostly to the BSA team who put this event together. The Captain of Industry sat regally at his table. Viewers paid homage to his motorcycles. Those who felt themselves worthy, approached the Captain of Industry with a question or two. Other friends sat and chatted. The Captain rose occasionally to make forays into the swap meet where he uncovered treasures and made killer deals. The Rebel was like a man released into his personal heaven after a long confinement. Friends he hadn’t seen in a long time wanted to talk to him. He could speak motorcycle for hours and here, no one acted bored or confused. Although he might rebel against anything you got, here he was an expert and he belonged. The Working Class Hero had a problem. 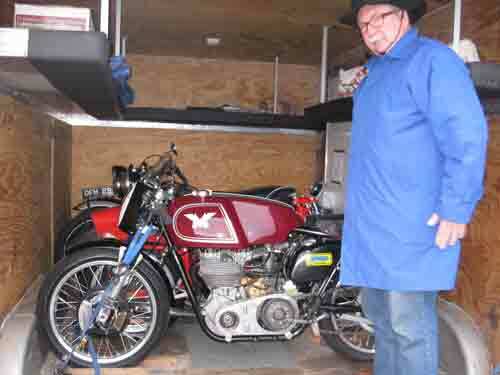 He had come to this gathering on a quest to get a carburetor for a 1963 BSA Bantam, 175 cc. While he didn’t assume such a part would be as common as chicken fluff at a barn raising, he had assumed that out of all the aficionados present, he would be directed to the correct carburetor. 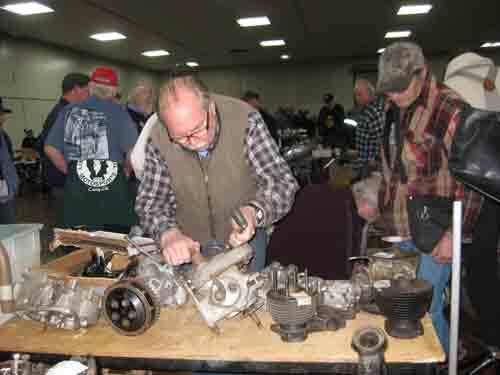 Two men at one table told him that they were selling a Villiers carb that would work, but he suspected what they really wanted to do was sell a part that was too small for most projects. He enlisted my help, and as an information specialist, I felt duty bound to do something. First I referred the Working Class Hero to the Master of Ceremonies, a BSA aficionado and well-respected expert. Sensing the Working Class Hero’s hesitation, I walked him over to the Master of Ceremony and introduced them. As I did this, I recognized that this meet was an information specialist’s nightmare. There was no cataloging. There was no order at all. Lots of necessary information existed only in memory and verbal stories. Yes, this was a nightmare and it was about to get worse. The Master of Ceremonies lifted his crutch to point us to someone else. This someone else was someone the Working Class Hero had already spoken to about the carburetor. Unfortunately this someone else was the son-in-law of the expert on BSA Bantams. Worse, this expert was dead. The son-in-law had not inherited this man’s memory. If we were going to find out anything from this source, we were going to have to hold a séance. Determined to find some more lively resources for the Working Class Hero, I raised the BSA question with some friends from the Velocette Owners Club. Thank goodness, one of these men, (a real estate tycoon and lady-killer), saw the potential of playing along. He waved a few other enthusiasts over to hash out the question. What kind of carb would be correct for a 175 cc BSA Bantam? Everyone who stopped long enough to consider this question, had an opinion. Stories of the evolution of this bike were told, and argued over. Some had reference books at home that would answer this information need. 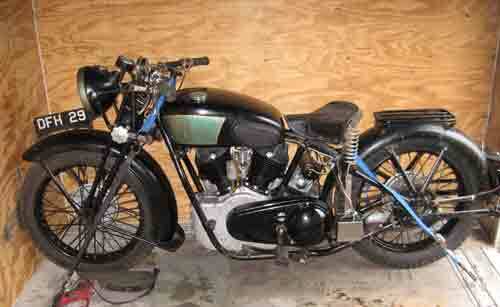 One man admitted that he had been given a similar BSA project, but it was still in boxes in his garage. Shared ignorance is bliss, said the real estate tycoon/lady-killer, with a gleam in his eye. Finally the Working Class Hero collected business cards and slips of paper with names and contact information. His quest would continue beyond the confines of this show. However, my part was finished. 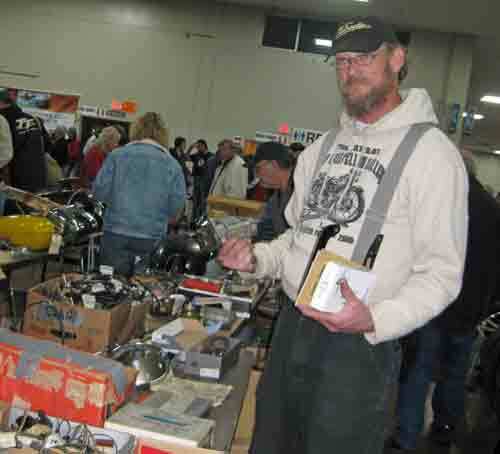 Jeff Scott seeks treasure at the swap meet. During the awards ceremony, I realized a couple of things. One is that although this kind of gathering may be an information nightmare, it also builds community and character. Another thing I realized is that energy still flows with hard work. The Rebel was shocked to hear his name called not once, but twice for one of the bikes he had put on display, the Royal Enfield. 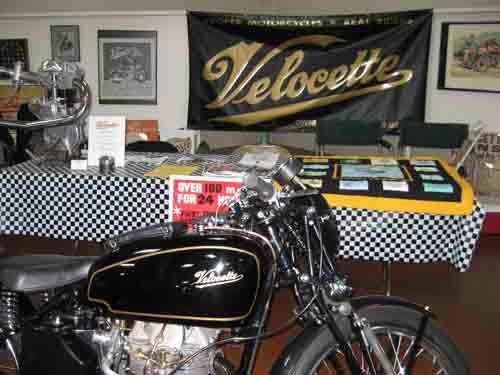 This entry was posted in Velocette & other British Motorcycles and tagged Lanora Cox, motorcycles, Velocette. Bookmark the permalink.